The date of his death and the place of his burial have been kept secret to avoid government checks. Bishop Liu spent 28 years in prison and many years under watch. A kung fu champion and expert chess player, he had a good rapport with young people. He never accepted compromises with the government and the Patriotic Association. Now it is up to young communist converts to Christianity, and a young bishop like Mgr Thaddeus Ma Daqin of Shanghai, to continue his struggle. Rome (AsiaNews) - "He ordained me and was my model as pastor," said an underground priest as he spoke to AsiaNews about Mgr Peter Liu Guandong, the underground bishop of Yixian (Hebei), who died last month. "He was a man who, to protect the Catholic faith, never accepted compromises with the government or the Patriotic Association," the priest added. "He was a real standard-bearer for the underground Church." Mgr Liu spent most of his life underground, which is where he died as well, on 28 October. His followers eventually made his death public after he was buried in a secret place on 29 October. Indeed, his Church has decided to withhold the date of his death and the location of his burial so as not to submit the orders of the Chinese regime. Since the government did not recognise Mgr Liu as a bishop, he could not me buried with the episcopal insignia - mitre or ring - or be referred to as a pastor. Yet, given his reputation as a hero of the faith, the news of his death saw police scramble to carry out checks on members of the underground Church. In fact, Mgr Liu was buried with all the honours and respect he deserved as a champion of a Church free from political controls. Bishop Liu died at the age of 94. He had been in hiding since 1997 after spending many years in prison. His first time in jail came in 1955 for 24 months, a few years after Mao Zedong's takeover. He was held behind bars from 1958 to 1981, again for the same reason: refusing to join the Chinese Catholic Patriotic Association, an organisation whose purpose is to build a Church independent of the pope. He was arrested again in 1989, after organising a gathering of all (30) underground bishops to set up a conference of bishops loyal to the pope. Unrecognised by the Holy See, the conference was short-lived following the arrest of all its members in the months that followed. After his release in 1992, he lived under surveillance until 1997, when he managed to escape. People from his diocese remember that, even though he had suffered a stroke, he was "lucid, courageous and full of faith until the end." A young man from Baoding (Hebei) said that in the past he saw him every week arrive at the shrine of Our Lady of Dong Lü to confess and pray. "He was always joyful, good. He led a very active old age, close to young people who liked his company." Another remembers his simplicity and informality. "He mingled with us," he said, "spending time talking to us, playing chess. He was a kung fu master and taught it to others." His integrity and desire to protect the Catholic faith from Communist ideological manipulations and unjust state controls led him to take increasingly independent positions and an uncompromising stand vis-à-vis the official Church. "He never agreed to collaborate with the bishops who joined the Patriotic Association," said another priest in his diocese. As for the police and the government, "he was always very clear and forthright, claiming the right of religious freedom [theoretically] guaranteed by the Chinese constitution." 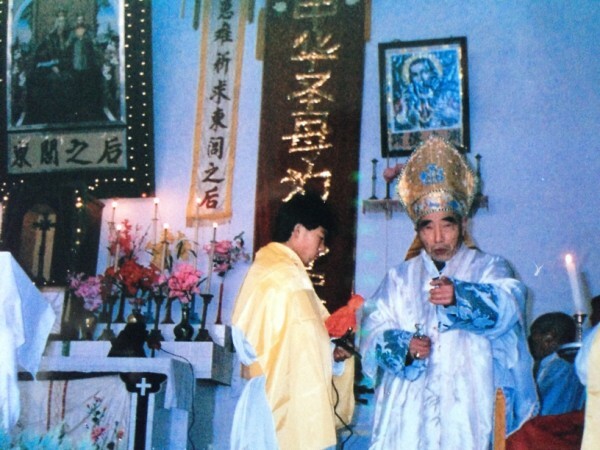 Politically, his life was a failure, an almost quixotic fight against windmills: 28 years in prison, 16 years in hiding, the bishops' conference he founded dissolved, and his diocese without a bishop since his successor in Yixian, Cosma Shi Enxiang, was seized by police in 2001, his whereabouts unknown ever since. Several observers in the Chinese Church and abroad think that his death marks the end of a chapter in the history of the Church in China, one that marked by a radical stance that brook no compromise with the regime. For some, the Church and the Vatican are now trying to be less radical. Yet, for underground communities, Mgr Liu remains a clear example to follow even today, when a corrupt government has lost the esteem of its people and demands for more freedom are rising from civil society. Although some bishops described by Benedict XVI as "opportunists" have emerged, soft-pedalling on some issues, something that the Vatican has done as well, Mgr Liu's witness continues to bear fruit. In Yixian, the diocese has dozens of priests and nuns, as well as tens of thousands of members. Some of the priests have experienced the same things as the bishop did. Fr Liu Deli for example was arrested, eventually dying in police custody. Overall, the bishop's legacy includes two positive outcomes, both of which are a source of hope. First, many young people, even Party members, have been drawn to the faith thanks to his courage. Like him, they claim a personal space for their spiritual life outside of every political control. As reformers within the Party, they want greater religious freedom for a nation suffocated by materialism. Leading the way among them is the 45-year-old bishop of Shanghai, Mgr Thaddeus Ma Daqin, who has been under house arrest since July 2012. The seeds Bishop Liu scattered in the land of silence will bear fruit for many years to come.